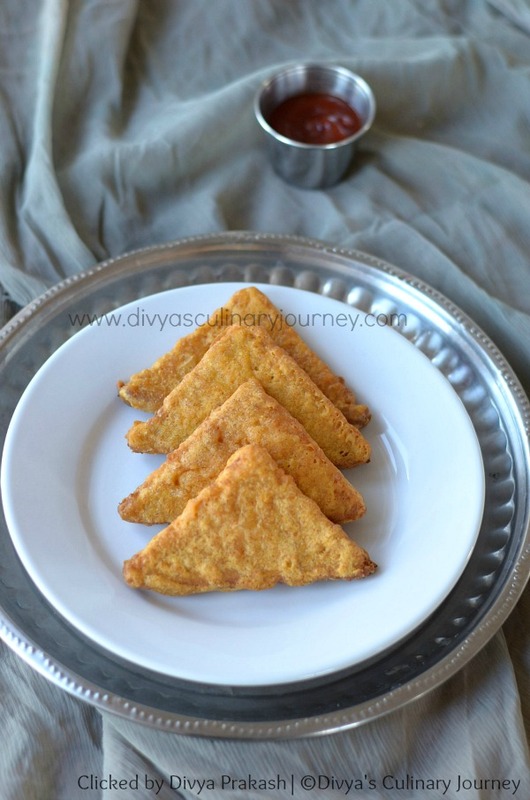 Divya's culinary journey: Bread Bajji recipe | How to make Bajji with Bread? 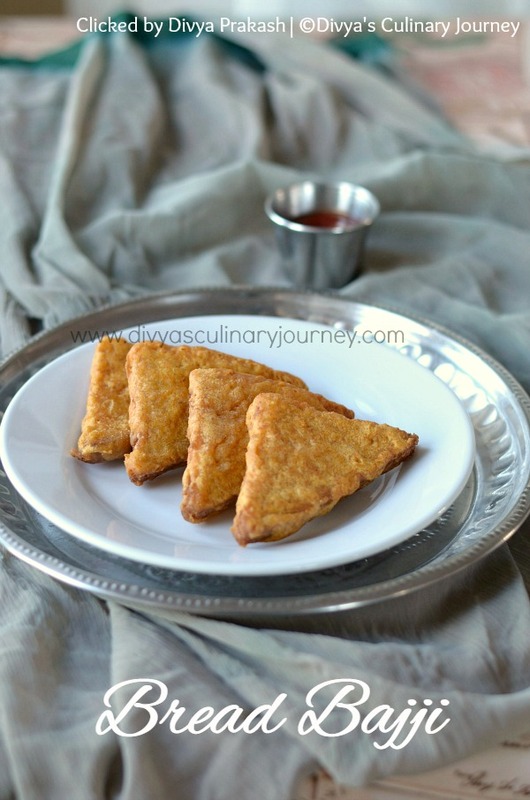 Easy to make bajji with Bread - Bread slices are dipped in gram flour batter and are deep fried and served as snacks. Bread Slices : 4 - 5 nos. Slice Bread diagonally or as desired. My bread was bigger in size, so I cut it diagonally into 4 pieces. Also if needed, you can trim the edges of the bread. I didn't do that. In a bowl add all the flours, turmeric powder, chilli powder, cumin powder, asafoetida, baking soda, salt and mix well. Then add required water to prepare the batter. Mix the batter well such that it is smooth and are no clumps. Dip the bread slices in the prepared batter such that it is evenly coated on all sides. 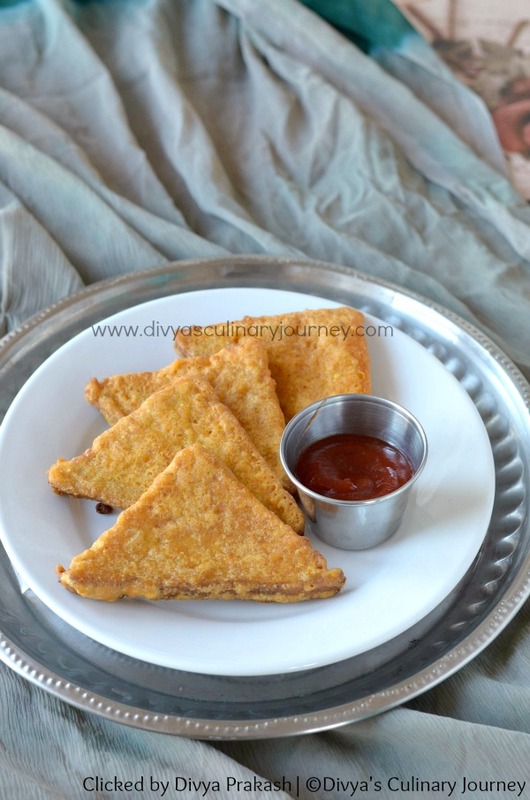 Shake off excess batter and deep fry in medium heat till it is golden brown. If needed turn them to the other side in between. Repeat the process for the rest of the slices. Remove them, drain excess oil and serve them warm. You can use white bread or wheat bread. If needed, you can add Ginger garlic paste 1 teaspoon in the batter. Oil temperature is very important while deep frying. If it is too hot, will burn quickly without cooking inside and if it is low, then it will absorb more oil. Batter consistency is also more important. It has to be neither too thick nor too thin. I added a little over 3/4 Cup of water. While serving you can sprinkle some chat masala, if you prefer. Loving the neat stack of bread bajjis, so perfect..